Plans for the construction of Hewson Hall and a fundraising campaign were unveiled today in a ceremony on The University of Alabama campus. 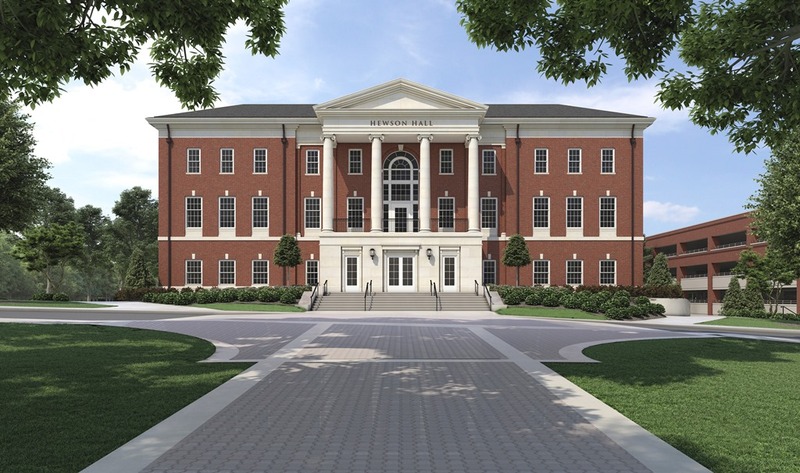 TUSCALOOSA, Ala. — The Culverhouse College of Business at The University of Alabama today announced plans for the construction of a new building to be named Hewson Hall in recognition of a previous $15 million gift from alumni Marillyn and James Hewson. The plans for Hewson Hall and a related campaign to raise a total of $30 million to match a commitment from the University were unveiled in a ceremony attended by the Hewson family, University of Alabama President Stuart R. Bell, and members of the college’s faculty, staff and Board of Visitors. A campaign committee headed by Birmingham businessman C.T. Fitzpatrick will lead the effort to raise the additional $15 million needed in charitable contributions. The project is expected to cost $60 million. Hewson Hall, which will be constructed adjacent to Mary Hewell Alston Hall, will be centered around a three-story atrium — a light-filled, dynamic space designed to connect faculty, staff and students. Plans for the 108,000-square-foot building include 22 classrooms, 50 team rooms, a student success center, conference rooms and other amenities. Building off the success of the Marillyn A. Hewson Data Analytics Lab and the Vulcan Value Partners Research Library and Trading Room — two learning and research spaces located in Bidgood Hall — Hewson Hall will include ample room for similar experiences where students will gain critical career skills while working on hands-on, real-world projects. Innovatively designed, the building will offer flexible space that can easily be converted from a traditional lecture format to a more intimate area for group work and discussions. Planned specialty classrooms include boardroom-style learning environments with high-tech teaching walls for students to learn in spaces equivalent to the ones they will be working in as professionals. Ultimately, the overarching design philosophy is rooted in adaptability, ensuring that classroom environments can accommodate future demands. A visionary leader in the aeronautics industry, Marillyn A. Hewson, chairman, president and CEO of Lockheed Martin Corp., and her husband, James, have long demonstrated a commitment to The University of Alabama. Announced in July, the Hewson’s $15 million gift supports the next stage of growth at the Culverhouse College of Business, which is where Marillyn earned a bachelor’s degree in business administration and a master’s in economics. James is also a graduate of the University, having earned a bachelor’s degree in communications. Last year the Hewsons also made a $5 million commitment to support the Marillyn Hewson Faculty Fellows Program in Data Analytics and Cyber Security, a high-tech Data Analytics and Cyber Security lab, and an endowed undergraduate scholarship and graduate assistantship in the college. More information about Hewson Hall, including renderings and how to participate in the campaign is available at culverhouse.ua.edu/hewsonhall. Enrollment at The University of Alabama reached 38,392 for fall 2018. Approximately 40 percent of UA’s freshman class scored 30 or higher on the ACT, and more than 36 percent were in the top 10 percent of their high school graduating class. The entering class in 2018 carries an average high school grade-point average of 3.71, with more than 34 percent having a high school GPA of 4.0 or higher. The class’s average ACT is 27.